I owe Peppa Pig a lot. Not only has that squeaky pink piggy given me several precious, priceless, moments extra sleep in the mornings, just enough time to ease myself out of the coma I’d undoubtedly fallen into after our usual disruptive nights. But she also saved me from having to jump in a muddy puddle wearing just my trainers. Oh no, Peppa says, “if you want to jump up and down in muddy puddles, you must wear your boots!” phew. Thanks Peppa, I owe you one, again. You see I’ve never been very good with dirt. I like things clean. As much as I’d like to be one of those outdoorsy types, I’m just not cut out for it. Even my one camping experience was cut short after I spent one night in a tent to watch the infamous Eclipse and woke up to find a bloody toad under my pillow. So that put a sharpish end to my tent stay and my want to ever try that out again. While we’re on the subject of the Eclipse, we had to traipse through miles of smelly cow fields to risk our lives perching on the edge of a cliff just to watch the clouds through those groovy cardboard Eclipse safety sun glasses in the wind and rain. I wasn’t impressed. But there were Pringles for breakfast, I remember that bit..see I told you I wasn’t outdoorsy. I don’t do dirt, I don’t do animals, I don’t do bugs and I really really don’t do mud. 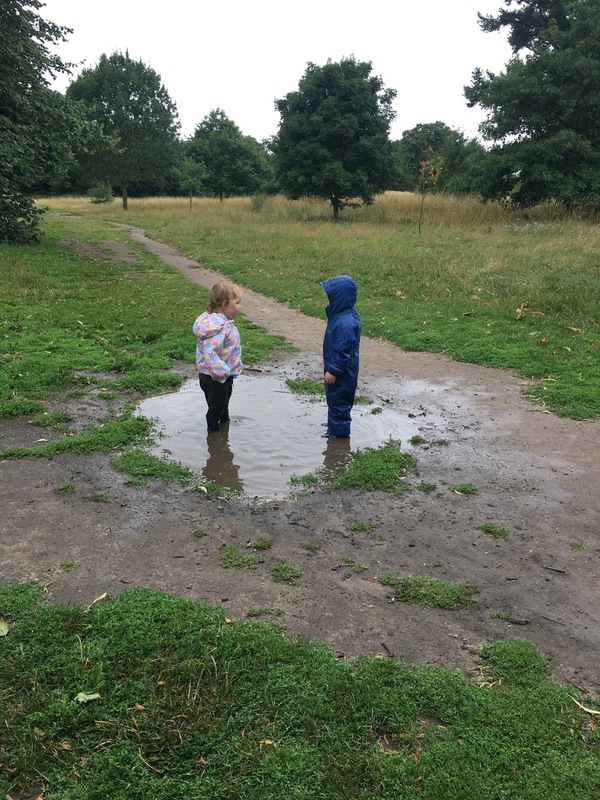 Last week when meeting a friend for a play date, she suggested that we still go for a walk even though it was planned for rain. My inner indoors clean freak had no excuses. Plus she promised coffee and cake, which won me over quite quickly. Shortly after the coffee and cake was consumed, (thank you lovely, it’s definitely on me next time!) the heavens opened and we scrambled to get our babies and ourselves rain ready. 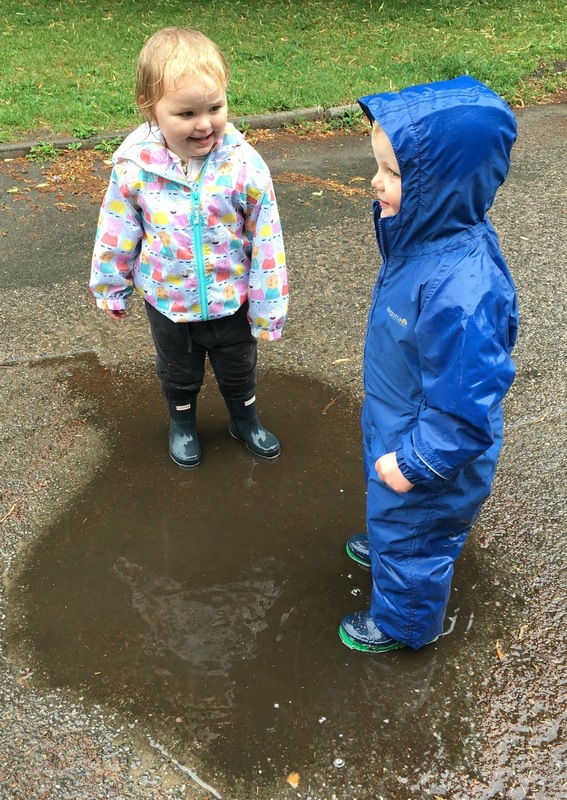 Once suited and booted my friend gave the sprogs the go ahead to find the muddy puddles. Find the muddy what?! Oh, crap bags. This sounds messy. Getting muddy and wet are two things totally out of my comfort zone, which was evident from Elsie’s response to this madness. She literally looked at me as if to say, really Mumma? I can do this?! Yep. All point to the bad Mumma. 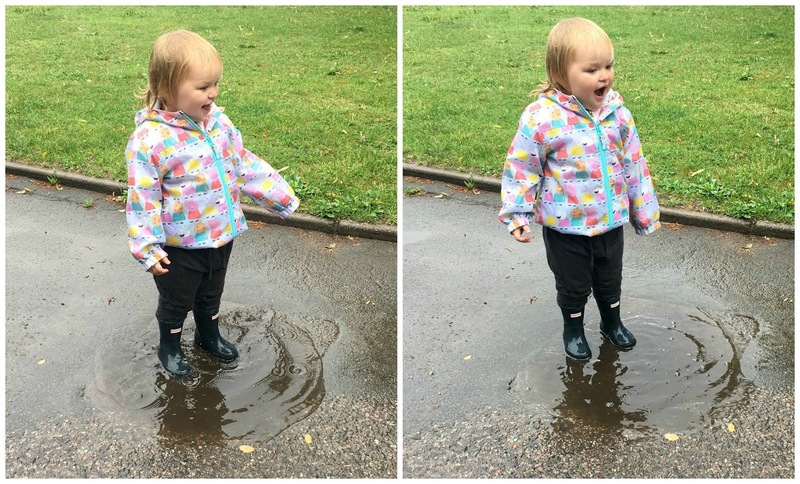 Up until this point, I honestly don’t think that I’d let the child jump in a rainy muddy puddle. How bad is that? It’s not that I haven’t on purpose, I promise, it’s just that when it rains, I’m the type of person who retreats inside and puts the kettle on, instead of thinking ‘hey peeps, let’s get our boots on and run outside to get wet and covered in mud!” Eek! But her face. Oh her face was a picture that made my heart both burst and sink. She was so happy. It was like watching The Little Mermaid, the bit where she gets her legs and doesn’t know quite what to do with them. So excited and so innocent the way that her face simply lit up with every splash, run and attempt at jumping. Yeah, she hasn’t quite got the hang of jumping yet, but we’ll get there. I think she couldn’t believe that I wasn’t pulling her away or wiping her hands clean. She was in her element and seeing that made me feel so guilty. As parents, there are so many aspects of you that you want to instill in your child, but rarely do you think about the parts that you don’t want them to become. As a child, I’m pretty sure that I was outside a lot of the time. We learned how to play with nothing except the space around us and our imaginations and as Elsie emerges from her baby stages into little girl territory, it’s becoming apparent that I need to let her explore the world so much more. I don’t want her to fear the outdoors like me, I want her to love it. I want her to have an abundance of interests and hobbies. I want her to know that there is so much more to the world than Peppa Pig on the television or Ben & Holly on her iPad. 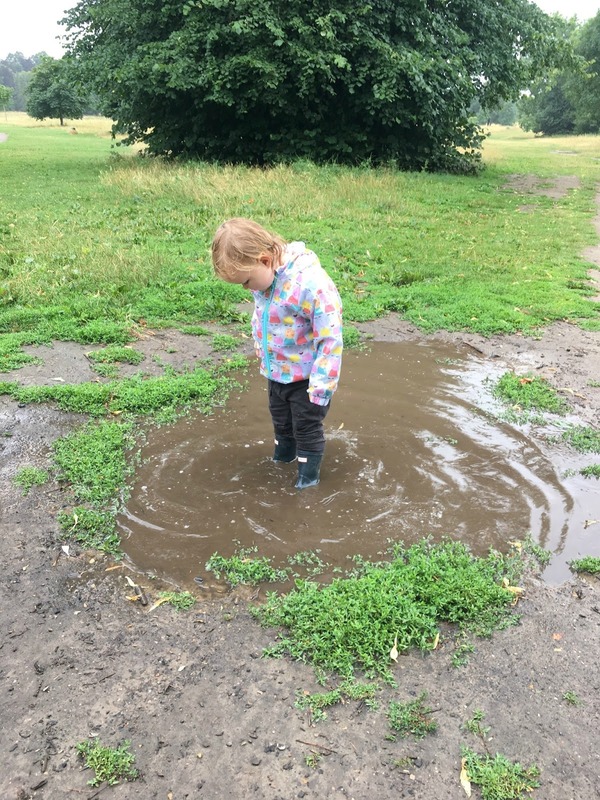 Just because as an adult I’ve chosen to prefer the indoors to the outdoors, I’m realising now that I need to let her experience as much as possible so that she can embrace the fun in everything life has to offer and if that starts with muddy puddles then so be it. 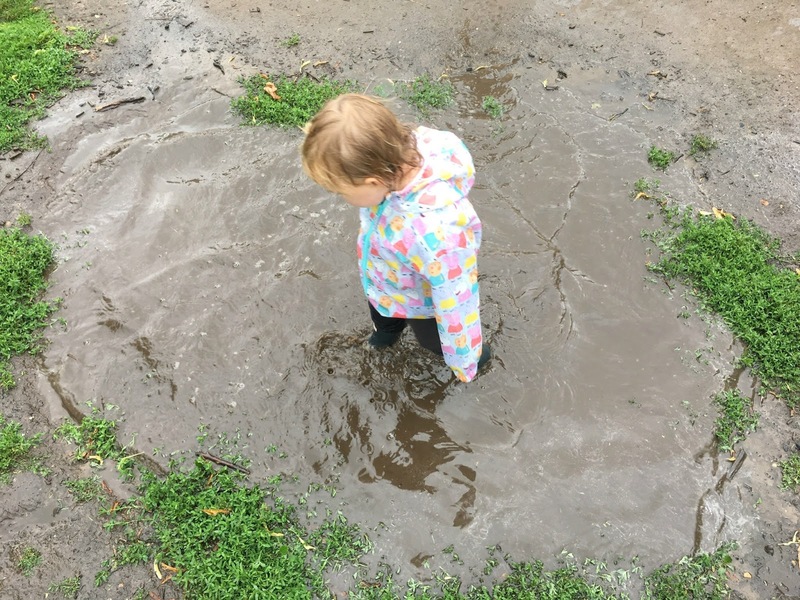 One day she wont even find muddy puddles as fun. One day she’ll just want to spend rainy days alone in her bedroom while she messages friends or listens to music that I just don’t get. One day she wont want to hold my hand and ask me to jump in muddy puddles. 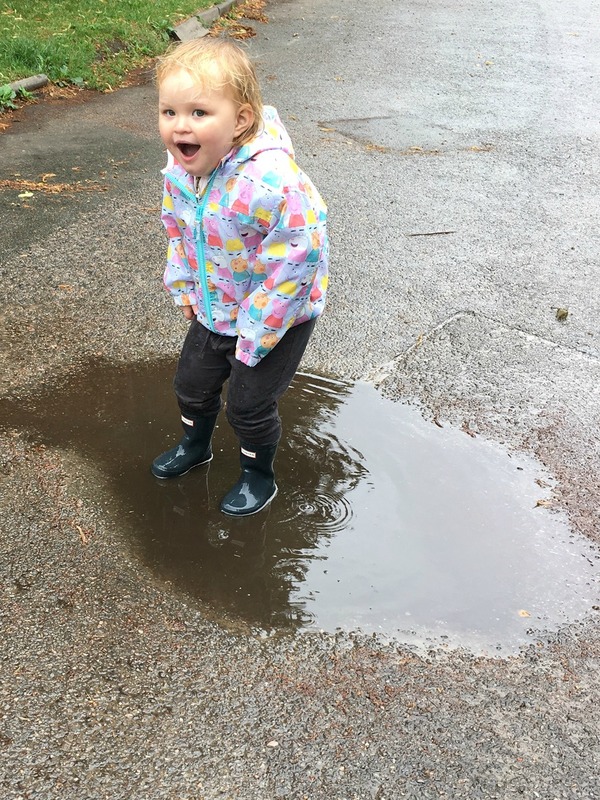 So I’ve decided that for her birthday, she’s getting a puddle jumping suit, just like the one her buddy was wearing and from now on when it’s raining, we’re all going to put our boots on and jump in muddy puddles.